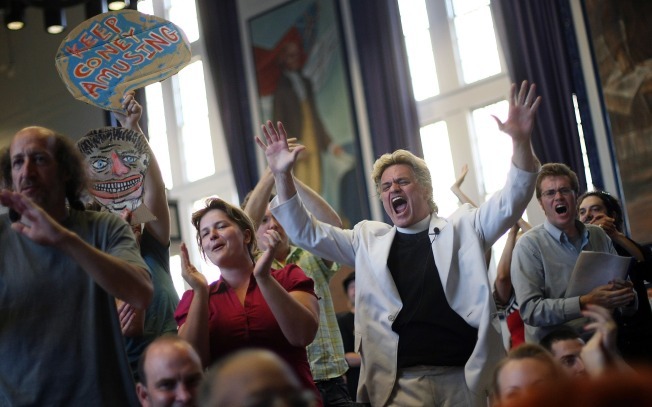 Shopacalypse Now: The Very Definition of the Word "Irony"
Reverend Billy and the Church of Stop Shopping exorcise demons during a public scoping meeting on the Coney Island proposed development plan last summer. Reverend Billy and his Stop Shopping Choir and the Not Buying It Band will appear this Sunday at the Highline Ballroom. And what will they do at their "Hot and Holy Highland Revival?" Why, ask you to buy their new CD "Shopacalypse," of course. And maybe get you to purchase the Morgan Spurlock documentary of their activities, "What Would Jesus Buy?" (Out on DVD now!). The blond-pompadoured holy roller Reverend Billy is a well known performance artist/activist whose stunts around NYC have included "retail interventions" at Disney and Starbucks chain stores and organizing mobs reciting the First Amendment into cell phones at Ground Zero. But there is nary nod to the hypocrisy of the Church holding its own CD release party. Could this all be just a little bit too deadpan?